In AGAINST THE GRAIN, Bill Courtney shares his convictions on the fundamental tenets of character, commitment, service, leadership, civility, and others that, in his decades of success as an entrepreneur and educator, have proven to be the keys to a winning and meaningful life and career. Each chapter tells the story of one of these tenets through compelling anecdotes of the colorful characters in Bill's life, leading to a deeper understand of the meaning of each and how to employee these fundamentals in all aspects of one's life. 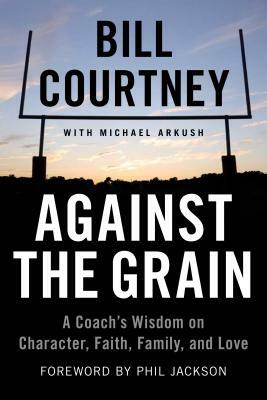 Against the Grain intertwines inspiring and thought-provoking anecdotes, lessons, and amazing real life examples. Bill's passion for us all to reconsider our own approach to life and constantly improve upon it comes across on every page. Set against the backdrop of a high school football season, Dan Lindsay and T.J. Martin's documentary Undefeated is an intimate chronicle of three underprivileged student-athletes from inner-city Memphis and the volunteer coach trying to help them beat the odds on and off the field. Founded in 1899, Manassas High School in North Memphis had never seen its football team, the Tigers, win a playoff game. In recent decades, the last-place Tigers had gone so far as to sell its regular season games to rival schools looking to chalk up an easy win. That began to change in 2004, when Bill Courtney, former high school football coach turned businessman, volunteered to lend a hand. When Courtney arrived, the Tigers were accustomed to timeworn equipment and a sorry patch of lawn as a practice field. Focusing on nurturing emotional as well as physical strength, Courtney helped the Tigers find their footing and their confidence. The 2009 Summer/Fall football season promised to be the Tigers' best ever  perhaps the season that finally breaks the 110 year-old playoff jinx. It was the senior year for the team's star player, O.C., a left tackle blessed with power, size and speed. With football scholarships hanging in the balance, O.C. juggles practice with the study sessions he needs to pass crucial exams. Also playing his last season is undersized offensive lineman Montrail  known to all as Money”  an earnest honors student hoping to score an academic scholarship. For Chavis, a talented linebacker in his junior year, the challenge of 2009 lies in keeping his explosive temper in check  something the willful teenager isn't always interested in doing. For players and coaches alike, the 2009 season was not only about winning games  it was about grappling with the unforeseeable events that are part of football and part of life. After debuting to critical acclaim at South by Southwest in 2011, The Weinstein Company won a fierce bidding war to acquire distribution and remake rights to the film. The film's wide release was met with widespread critical and popular acclaim, culminating in the 2011 Academy Awards, where Undefeated won the Oscar for Best Documentary. Plans for a feature film remake are currently in motion. Bill Courtney is a volunteer football coach and the owner and operator of Classic American Hardwoods, a 45 million lumber company and sitting board member of the prestigious Society of Entrepreneurs. He is a sought-after motivational speaker and consultant for organizations such as Nike, Pepsico, the USOC Paralympic Leadership Conference, the FedEx Leadership Live Conference, and the Fellowship of Christian Athletes. Courtney lives with his wife and four children in Memphis, Tennessee. Michael Arkush has written 12 books, including Rush! and The Fight of The Century. He and his wife, Pauletta Walsh, live in Oak View, California.  JIMMY KIMMEL, comedian and host of Jimmy Kimmel Live!